Artist's concept depicting an imminent planetary collision around a pair of double stars. Two Earth-size planets that orbit each other might exist around distant stars, researchers say. The solar system has many examples of moons orbiting planets; Jupiter and Saturn both possess more than 60 satellites. However, these moons are usually much smaller than their planets — Earth is nearly four times wider than its moon and more than 80 times its mass. Binary stars, or two stars orbiting each other, are very common throughout the Milky Way galaxy. Some of these two-star systems are even known to host exoplanets — worlds with two suns, like Luke Skywalker's home planet of Tatooine in "Star Wars." Binary asteroids also exist in the solar system. However, binary or double planets involving Earth-size worlds are currently only science fiction. One possible way that binary planets might form is when two worlds orbiting a star get close enough to one another to interact gravitationally. To see if these systems are possible, researchers simulated two rocky Earth-sized planets veering toward each other. They modeled each world as made up of 10,000 particles and varied the speed of the planets and the angles of their approaches. The scientists managed to simplify their models so that each simulation took as little as a day to run instead of up to a week as they did at the beginning of their work. The scientists ran about two dozen simulations. 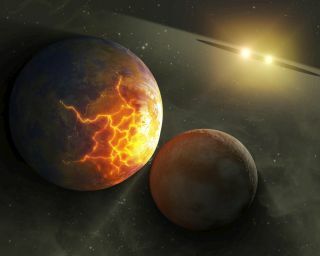 However, these simulations often resulted in the planets colliding, typically merging or accreting together into a larger planet and sometimes leaving behind a disk of debris from which a moon could form. Also, in some simulations, the planets collided in a grazing manner at high speeds, resulting in "hit and run" interactions in which the worlds escaped from one another. Still, about one-third of the simulations resulted in binary planets forming. These involved relatively slow, grazing collisions. "Previously, the only expected outcomes of large-body impacts of this sort were escape or accretion — that is, either the two bodies do not stay together or they merge into one, occasionally with a disk of debris," study co-author Keegan Ryan, an undergraduate student at the California Institute of Technology in Pasadena, told Space.com. "Our findings suggest the possibility of another outcome — binary planets. The bodies stay mostly intact, but end in a bound orbit with one another." These binary planets would loom extraordinarily close to one another, separated by a distance of about half the diameter of each of the worlds. Over time, the rate at which both planets spin would fall into lockstep, with each world only turning one face toward its partner. The research team's goal from here "is to run more simulations, increase the parameters of the simulations, and work to get a better picture of the probability that a binary planet might form," Ryan said. Ryan and his colleagues Miki Nakajima and David Stevenson detailed their findings Nov. 11 at the American Astronomical Society's Division for Planetary Sciences meeting in Tucson, Arizona.